As a hardware manufacturer, we’ve been paying a lot of attention to the Windows XP phaseout, which which became official earlier this month when Microsoft announced the end of support for the operating system. Since our regular customer and partner reminders began about six months ago, we’ve been tabulating the OS and browser configurations of our own site visitors, and it turns out that the experts were right: Despite the widely-publicized warnings about the lack of security patches, and the resulting vulnerabilities that would arise, not everyone was off of XP by the drop-dead date. So, three weeks after the Windows XP Apocalypse, what does the current scene look like? When we first started reminding customers back in October 2013 about XP’s impending retirement, nearly a quarter of visitors to our website were still using the aging OS. That was less than the estimated 30-40% worldwide, but enough to be a problem either way. Jump ahead to March of this year, just before the deadline, and the number of XP holdouts had decreased to just 12.9%. That’s an impressive achievement for six months, although it still left roughly 1 in 8 users running an unsupported OS. Interestingly, there was no noticeable acceleration of conversions, or any one event that caused a mass migration – just a steady pace of about 2% switching every month. From April 8 onward, about 11% of visitors have continued to use XP even beyond the official deadline. While still not ideal, that’s nothing near the disaster many had predicted last year, when a third of all computers were still on XP. Another theory that got attention was that many XP computers were located in developing countries; therefore, they would be more likely to be “stuck” because upgrading to a new OS or a new computer would be cost-prohibitive. The observations from our own site seem to support this; the U.S. had a relatively low frequency of Windows XP use after April 8, at around 9%, while all traffic from the rest of the world averaged almost 21%. However, since these results account for only the traffic to our own site, it should be noted that they are far from scientific. 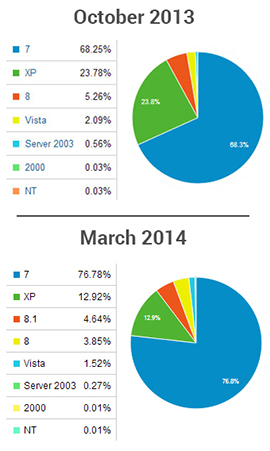 Tellingly, of the former XP users who migrated to another system over the past six months, most switched to Windows 7, not Windows 8 or 8.1 – this despite the fact that in the meantime, Microsoft discontinued retail sales of 7 except for OEM copies (e.g., for new computers with Windows 7 pre-installed, or for do-it-yourself system builders). That Windows 8 only saw a bump of a couple percentage points does not bode well for the much-maligned operating system, and further strengthens my belief that the next big thing in operating systems will be Windows 9, continuing the skip-a-generation trend that has gone on for some time. No matter whether it’s well-received or not, Windows 9 is almost certain to be successful given the present circumstances – you can’t get 7 anymore, nobody likes 8, and computers need to be replaced every so often … so 9 will be the default for anything new from the moment it comes out. What’s the next big end-of-life milestone on the horizon? That would be the retirement of Windows Vista on April 11, 2017. But, let’s face it – there are so few people on Vista that they could probably retire it now without much effect (with a few exceptions, such as the gaming PC I built back in 2008). That means the next time we’re likely to see a situation like this again is 2020, when the plug on Windows 7 is finally pulled.